In a recent paper in the Lancet Infectious Diseases, Pritt et al have identified a new genospecies of Borrelia which is attributed to have caused several cases of Lyme disease, marked by a high degree of spirochetemia. Does E. ewingii Cause More Cases of Ehrlichiosis Than Previously Thought? 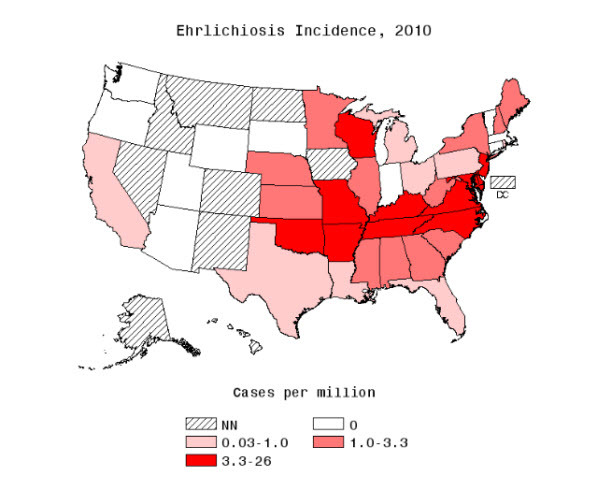 This figure shows the incidence of ehrlichicosis cases by state in 2010 per million persons. Ehrlichiosis was not notifiable in Alaska, Colorado, the District of Columbia, Hawaii, Idaho, Iowa, Nevada, New Mexico, North Dakota or Montana. The incidence rate was zero for Arizona, Connecticut, Indiana, Massachusetts, Oregon, South Dakota, Utah, Vermont, Washington, and Wyoming. Incidence ranged between 0.03 to 1 case per million persons for California, Florida, Louisiana, Michigan, Ohio, Pennsylvania, Rhode Island and Texas. Annual incidence ranged from 1 to 3.3 cases per million persons in Alabama, Georgia, Illinois, Kansas, Maine, Minnesota, Mississippi, Nebraska, New Hampshire, New York, South Carolina and West Virginia. The highest incidence rates, ranging from 3.3 to 26 cases per million persons were found in Arkansas, Delaware, Kentucky, Maryland, Missouri, New Jersey, North Carolina, Oklahoma, Tennessee, Virginia, and Wisconsin. Ehrlichiosis is caused by three species of bacteria belonging to the genus Ehrlichia: E. chaffeensis, E. ewingii and the provisionally named E. muris like (EML). A recent article in the CDC’s EID indicates that the proportion of cases attributable to E. ewingii may be higher than what we initially knew it to be. Ritual slaughter of animals has a special place in the socio-cultural matrix of several countries. 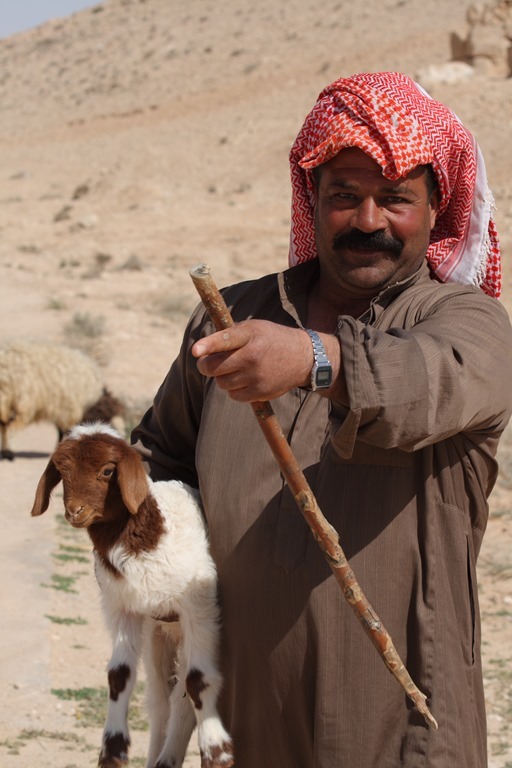 A recent correspondence from Israel, published by the U.S. Centers of Disease Control and Prevention journal Emerging Infectious Diseases highlights a small case series where the only identifiable route of transmission was the contact shared by the exposed individuals during a ritual slaughter of sheep purchased from Bedouins. Israel has been experiencing a rapid rise in the number of cases of brucellosis owing to the scrapping of “test, slaughter and compensate” policies for small ruminants in 1997, in addition to some other contributory factors. This article highlights the unusual route of transmission through ritual slaughter of infected animals. Myiasis Associated Septicemia with Wohlfartiimonas: Innocent Bystander or Wolf in Sheep’s Clothing? The recent issue of the U.S. Centers for Disease Control and Prevention’s (CDC) journal, Emerging Infectious Diseases (EID), has published a couple of cases of septicemia in two elderly people with Wohlfartiimonas chitiniclastica, of whom one had succumbed to the infection. This comes as an addition to a growing body of evidence about this rare infection, associated with the fly Wohlfartiimonas magnifica, which has been most commonly been associated with myiasis. Image Credit: CDC EID via Joaquim Alves Gaspar, Wikimedia Commons. A recent article from the U.S. Centers for Disease Control and Prevention (CDC), published in the Morbidity and Mortality Weekly Report (MMWR), describes the results of an intensive contact tracing program initiated after it was suspected that a Nebraska man, who had pulmonary tuberculosis attributable to Mycobacterium bovis, had acted as the primary focus for person-to-person transmission to other susceptible people, through airborne routes. The CDC’s Emerging Infectious Diseases Journal reports the finding of novel zoonotic species of Bartonella, the organism responsible for several chronic infectious diseases in man. This adds to the increasing awareness and growing evidence that there is more than what meets the eye when it comes to understanding the zoonotic potential and pathogen emergence as more and more microbes, traditionally thought to be disease causing in animals, are easily jumping across the species barriers to affect man.